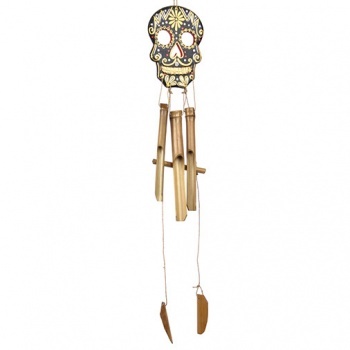 This windchime has been decorated with a strikingly bold candy skull design. Inspired by the Mexican tradition of making candy skulls during the Dia de Muertos celebrations at the beginning of November, our candy skulls are hand carved and carefully painted in Bali. The windchimes themselves are made using fast growing bamboo and have a bar knocker. Perfect for hanging up in any tree in the garden.